A fan of machines since he was a kid, he joined the Columbus Buggy Company as a salesman. By 1910 Rickenbacker drove his company's cars in races on sand tracks to promote the speed and product development. Later he joined Fred Duesenberg and drove his cars in the Indy 500. He was the first man to drive a mile in a minute, for which he was nicknamed "Fast Eddie". Rickenbacker participated in the Indy 500 in 1912, 1914, 1915 and 1916. The only time he finished was in 1914, arriving 10th. In the rest of races, he did not end due to mechanical failures. During WW1 and due to the anti-German atmosphere of the moment, he changed his family name Rickenbacher to Rickenbacker. As he was famous for his car racing activity, "most of the Rickenbachers were practically forced to pronounce their names the way I had done ..."
When in 1917 the US entered the war Rickenbacker was already enlisted in the Army and was training in France. Most men selected to be trained as pilots came from prestigious universities, so Rickenbacker had to fight to get flying permission because of that. Due to his mechanical knowledge, he was an engineer in a flight field where he learned to fly. However, given that his mechanical knowledge made him indispensable, the commanding officers tried to avoid his transfer as a pilot. Eventually he was assigned to the 94th Combat Squadron, known as the 'Hat on the Ring' Squadron because of their badge. 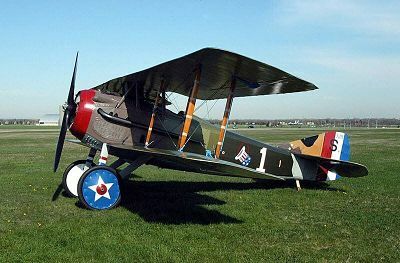 On April 29, 1918, he shot down his first German aircraft and shortly after he got his fifth victory, so he became an Ace and was decorated with the French Croix de Guerre. After his sixth victory he suffered an ear infection that kept him on the ground for several weeks. After recovering, in September he shot down a Fokker D.VII (the best fighter aircraft of the war). At the end of the month and as captain, he was named squadron commander, and achieved victory after victory (Fokkers D.VII and some observation balloons). Rickenbacker ended the war with 26 victories, which was an American record until World War II. He flew 300 combat hours, which makes his ratio one of the most effective among all WW1 pilots. In 1931 President Herbert Hoover decorated him with the Medal of Honor for his achievements in the war. After WW1 Rickenbacker dedicated to numerous activities: he started up a new car brand with four-wheel brakes (something non-existent until then) that was not successful due to the boycott of the main car manufacturers, although later it became a standard of the automotive. In 1927 he bought the Indianapolis circuit, which he managed until WW2. Rickenbacker also created a popular comic called Ace Drummond between 1935-40 along with the illustrator Clayton Knight, about the adventures of the aviator Drummond, that became a movie and a radio serial. For decades he was President and CEO of Eastern Airlines, after buying the company along with General Motors director Alfred P. Sloan for 3.5 million dollars. During his life he suffered several serious aviation accidents, such as in 1941 as a passenger in a DC-3 that crashed near Atlanta. However, he recovered months after his very serious injuries only to crash again in the Pacific in 1942 during a secret mission in World War II and remain shipwrecked along with others for 24 days. During WW2 he contributed as a civilian and as a leader of Eastern Airlines to the war effort. He visited training campsand carried out coordination missions with the British and the Soviet. After a life full of stories and dangers, Eddie Rickenbacker died in 1973 of a heart attack at age 83 while he was in Switzerland with his wife.